I seem to be better than a lot of people from when I go to the arcade, but I think my strategy leaves a lot to be desired. I figure I I just put out exactly what I do, someone can come in and tell me what I need to work on, as I'm no good at building strategies on my own. 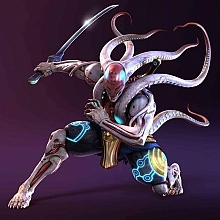 I naturally gravitated towards Yoshimitsu when I first started the game. (Oddly enough, I only started because there was a panda in it.) After about a month of renting SCIII from gamefly, I hadn't used him once. Now I've got Tekken 5, and I found I enjoyed his numerous stances, and later realized I was good with his power attacks. Anyway, to the meat of this post. When I start against someone I don't know, I use > 1+2 and < 1+2 (The forward and back body slams) right off the bat to try to get them on the ground. Assuming I'm better than them, I follow it up by kamekaze-ing them as soon as they start coming back at me. I'm pretty good with the kamekaze, and rush at them when they arent blocking, even if they're the type to block quite a bit. If they hit me, out of vanity I'll often go to the indian stance to heal for a perfect, using a kangaroo kick or just moving to get out of it. Often I'll beat them with nothing but kamekazes and the occasional slam. HOWEVER: If they're better than me, I'll start getting technical. I'll throw in the occasional grab, slam and kamekaze only when I think my attack will get in before a slow one of theirs, and if they go low, I'll start jumping on them with the flea. If that doesn't work, and they continue blocking: I'll get desperate, and use only kamekazes and grabs, using the flea if they go low, but that never seems to work. I'll usually lose from anywhere between their perfect, and a very close match. I know I'm forgetting to juggle, but I always have trouble getting the combos in at the right pace, or I'll just flat forget them. What should I work on mastering, and are there any really good combos I should try harder to work in? Well... But are you talking about Tekken 5 or Tekken DR? If you have a game in your home, then it's good to make some practice. Also, go to match movies and upload some Qdogg versus Souten fights... by watching them, there's a lot to learn... If you have any specific questions, feel free to ask. I've been mixing it up. While most of my wins come from the simple spam of kamekaze, I've been landing small juggles and f+2,f+throw. Easy fifty-something damage. Even if I mess up with the grab, I end up accidentally inputting f+3 which works as well. What I really need are some general moves to hit feg with after blocking a move of his. It's probably better to use something other than just the body slams as a first attack. If you play in a tournament, eventually your opponents will get wise and block it first thing. One stratagy I use a lot is to always use df 3,3,3,3,3 when they're on the ground after knocking them down. It does a decent amount of damage. I also use d 3+4 after using a body slam or whenever the opponent is far away. As my first move, i check my opponent by blocking, then feinting a move and blocking again. That way i found out the response time and if im lucky i can figure out their style, defensive, offensive or my personal favourite - oppurtunist. *admires self in mirror, lol* After i do my check i give him little jabs (triangle, triagle). When i feel i know him enough, i go full out! My first move really varies from a f+2,d/f+2 juggles, u/f+3 juggles, u/f_u_b/f+4, f,f+4, or just B, depending on how I think my opp will do his first move. On grounded opps, I sometimes use d/b+3,3..., FC,d/f+1, FC,d/f+3, u+3+4, d+1+2, or d+1. Sometimes, I wait a while before they roll and do a f,f+4 or d/f+3. Yeah, before I'm more of a juggler spammer. Now that I see the power of pokes, some of my games usually end with fewer juggles and a spam of pokes. But some characters (specially christie or xiayou) are more prone to be hit by f+3+4, so I use it more often against them. what i do when my enemy is grounded is quickly stab him whilst in flea mode and then do running flea, go into indian stance (you can go straight to indain stane from running flea) and when he gets upi either press square or X depending on how far away they are.